Imagine walking in a distant, winter dried forest. Suddenly a flash of color catches your eye and as you turn to see what it is, you see a cardinal light on a bare bush. The beauty of the red bird, in contrast to the stark surroundings, burns the image into your memory. 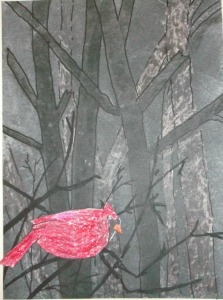 You’ll find the directions for, “Red Bird,” in the 5th Grade Projects Gallery in the sidebar. For a closer look, click on the image above. This entry was posted in 5th Grade and tagged 5th Grade, cardinal, chalk, forest, masking tape, red bird, red bird visit, winter. Bookmark the permalink.